It’s hard not to compare a director/writer’s freshman and sophomore efforts, especially when the subject matter is so intertwined, and that’s exactly how most critics are sizing up Neill Blomkamp’s “Elysium”. First, let me say this: “District 9” is better. Blomkamp turned the science fiction genre on its head with his breakout 2009 darling, which dealt with social issues like racism, xenophobia and late 20th century apartheid and segregation. This time, Blomkamp turned his focus to much more pointed and immediate issues, such as immigration reform, wealth inequality and health care. While its themes are broader in scope and more controversial in nature, they are generally more caustic and heavy-handed in tone. “Elysium” knows where it stands, and refuses to compromise either way. 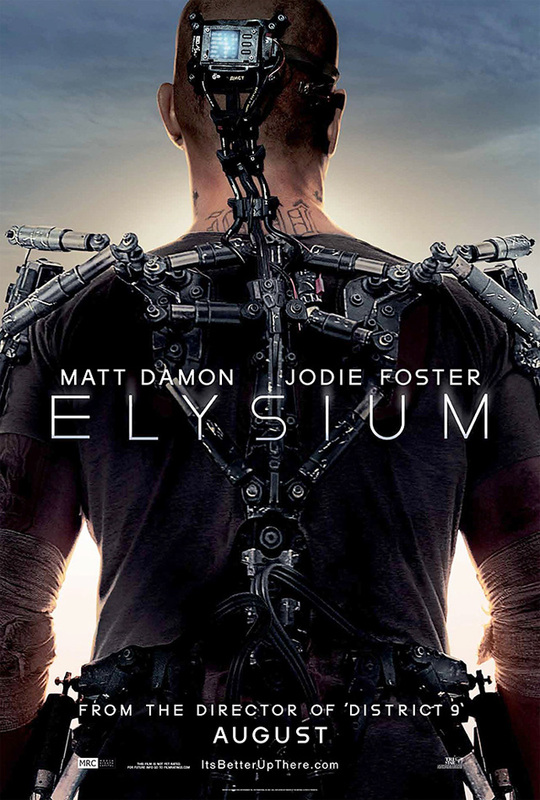 “Elysium” might force the issue a bit with its in-your-face social justice, but it works pretty well as a sci-fi thriller. Much in the way that “Blade Runner“ turned Los Angeles into a film noir, dystopian nightmare, “Elysium” captures the future L.A as a gritty, overcrowded slum, largely Latin-based in culture and eerily plausible. The actual look of the movie is uniquely possible and Blomkamp delivers action at just the right pace to keep those less interested by mise-en-scène and motifs satisfied. Sharlto Copley is once again enjoyable, though he plays quite the foil to sympathetic Wikus van de Merwe of “District 9”, which was his feature film debut. Matt Damon’s social activism made him an obvious choice for the protagonist, Max, and Jodie Foster was great as the vicious and calculating Secretary of Defense Jessica Delacourt. So far, “Elysium” has enjoyed generally favorable reviews and has made back its $115 million budget, but has largely been thought of as a step down for Blomkamp. This was my most anticipated movie of the year, and I can’t say that I was completely satisfied with the experience. But I can say that as a stand-alone film, it was great. The ending was predictable but it made sense, and any gripes that viewers have had with “Elysium” have been largely fastidious. It seems that everyone wanted another “District 9,” which was unfair and impossible for Blomkamp to deliver. If one takes the time to watch “Elysium” on its own terms, they’ll be pleasantly surprised by just how enjoyable of a film it is. Many films that are now sci-fi staples were once in the same mediocre category that “Elysium” finds itself. “Blade Runner” and “Dark City” were misunderstood upon the time of their release, and it took years for them to find their place among the annals of cinema greatness. So, too, will “Elysium.” The way we look at the world and its issues changes much more rapidly than we think, and 30 years from now I believe “Elysium” will be looked back on as way ahead of its time.